Melt the chocolate in the microwave for 30 seconds on high, stir, melt for another 30 seconds, then melt for 5-10 seconds at a time if not completely softened. A dash of vanilla extract + any no calorie sweetener of your choice can be substituted for the DaVinci syrup. Tastes extra heavenly with a dollop of fresh whipped heavy cream. 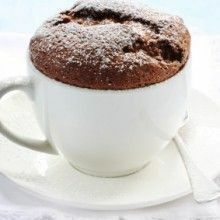 Mix all ingredients in a microwavable cup (such as a coffee cup). Microwave for 45 seconds to one minute, divide into two portions, and enjoy!